Side dishes, by definition, most often don't get prime attention. Seasonal sweet corn, however, can quickly become the star of the show at this time of year. A little salt and butter usually suffices to dress it up, but this is a really easy to add a little more oomph. I always have sumac on hand in my pantry. This red-toned Middle Eastern spice adds a good dose of lemony flavour and is now quite readily available. I like to add it to salad dressings, and often sprinkle a generous amount on grilled boneless chicken breast. In this case, I mixed it in with some melted butter. If you haven't cooked with sumac before, this is the perfect recipe to get you started! Steam, or grill corn until tender. In small bowl, whisk together the butter, sumac, salt and pepper. Brush over warm corn. Enjoy! The heat has been sweltering for the past few days so heavy meals have been crossed off the list to leave room for light, no-oven-needed meals. I have popsicles in the fridge (peach and mint!) and have been making chilled soup (you might have seen my cucumber, avocodo and chive soup on Instagram!). A few fresh berries topped with a dollop of cream is a nice alternative as well, and it couldn't be easier to make! This week, in the Canadian Living Test Kitchen, I've been in holiday paradise -- with dozens upon dozens of cookies, complete with cakes, turkeys and holidays sides. I often get asked what Christmas in July feels like, and to be honest, I quite love it! I won't pretend it's the easiest way to maintain a healthful diet (it's contant temptation! ), but it's a fun time to create recipes for. It's all about sharing food, taking the time to make a meal, and indulging. It also makes me than much more excited to come home after a long work day and cook seasonally. I can leave snowy desserts and winter comfort food behind and cook according to the time of year. And, once the actual holidays come around, I've had enough time to recuperate so I can get excited about the festivities, all over again! In bowl, beat cream until soft peaks form. Add sugar and beat until combined. Fold in vanilla and Grand Marnier. 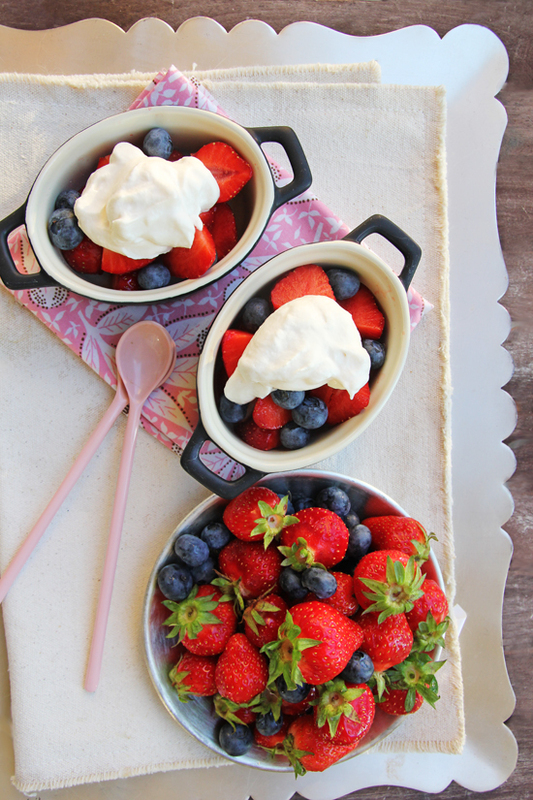 Spoon over berries.Enjoy! 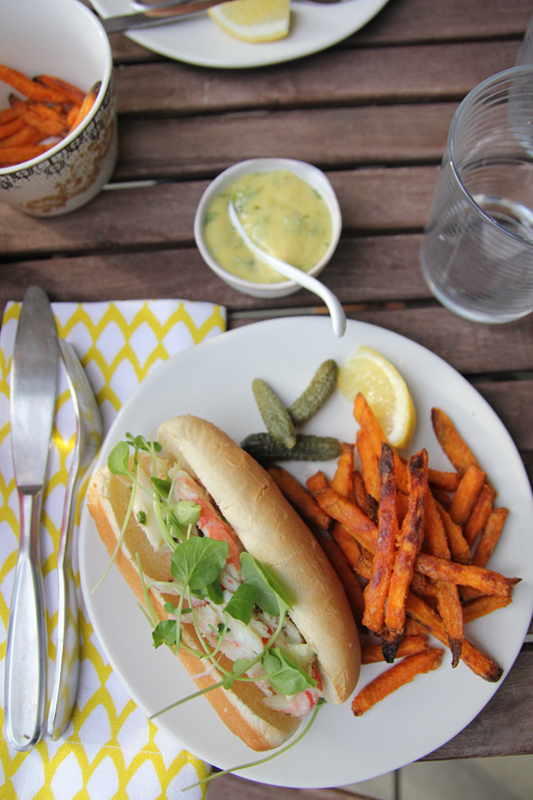 Sometimes, I struggle with the desire for a Sunday-worthy meal on a busy weeknight. A classic roast chicken, for example, is something I crave time and time again. To be honest, what I really crave are the 'rotisseries' I grew up eating in Paris. Chickens are roasted whole on large metal rods, and gently turn as the skin gets crispy and the meat stays nice and juicy, The fat from the chicken drips down and most butchers cook potatoes -- and sometimes lardons (strips of bacony goodness) -- under the roasting chickens so they get flavoured while they cook. It's making me want a plateful just describing it! In lieu of a trip back home to Paris, I have a great recipe for a weeknight roasted chicken. I like to cut the chicken into pieces (legs, thighs and breast) so that it cooks faster and is easier to marinate -- I then pop the pieces in a ziploc bag with my marinade ( in this case thyme, garlic, olive oil, lemon and oregano) and let it sit in the fridge all day while I'm at work. This kind of dish hits the spot every time! In the absence of a barbecue, I make the chicken in an oven, but for all you lucky backyard barbecue owners, grill away! Add chicken to a ziploc bag. In a small bowl, whisk together olive oil, lemon juice and zest, thyme, garlic, oregano, and a pinch each of salt and pepper. Pour mixture into bag. Seal and shake to combine. Refrigerate for at least 4 hours. Lightly grease a roasting rack and evenly lay out chicken pieces. Season with a little more salt and pepper. Bake at 425°F for about 15 to 20 minutes, or until chicken is just cooked through and the juices run clear. The breast should cook quicker than the rest of the pieces, so check on the breast a couple minutes before. Broil for about 2 minutes to get a little extra colour on the skin, if needed. Once out of the oven, tent with aluminum foil to rest for 10 minutes, so the chicken stays nice and juicy. While the chicken is cooking, move on to the salad. Add the Halloumi cheese slices to a nonstick skillet over medium high heat. Cook, turning once, until Halloumi is golden, about 2 minutes per side. Cut into chunks and set aside. Cook asparagus in a pot of salted boiling water until tender crisp, about 3 minutes. Drain and add asparagus to a bowl of ice cold waterto stop the cooking process. Drain, pat dry, and cut into thirds. In a bowl, toss together lettuce, cucumber, cherry tomatoes, and asparagus. In a small bowl, whisk together Dijon mustard and olive oil until the mixture is homogenous. Whisk in red wine vinegar, and a pinch of salt and pepper. Drizzle dressing over salad, stirring to coat. Transfer to serving platter, top with Halloumi pieces. 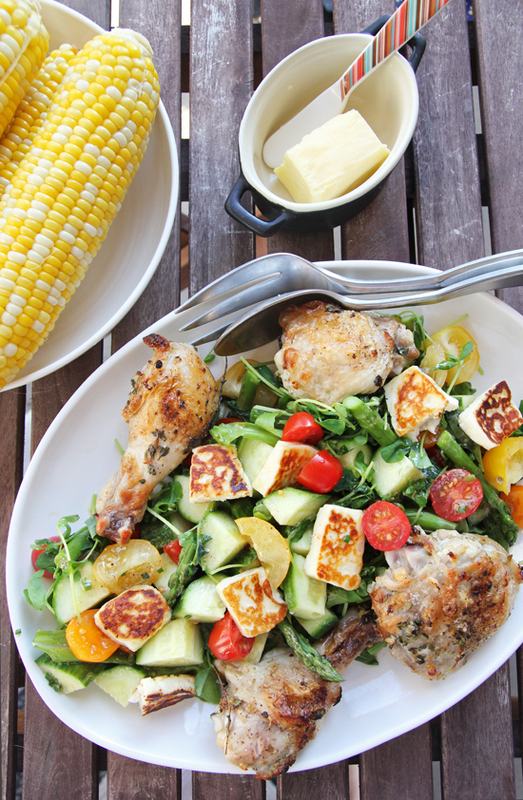 Arrange chicken pieces around salad. 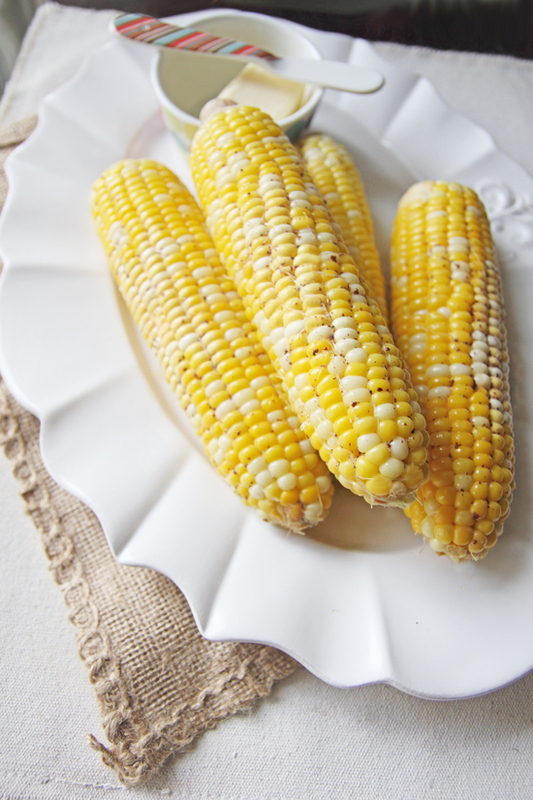 Serve with steamed corn and butter. Enjoy! Putting together healthy, fast and satisfying weeknight meals may very well be the Achilles heels of most cooks. I spend the better part of my professional days developing recipes and coming up with easy dinner solutions for Canadian Living readers, but I do often come home with the eternal, almost cliche, "what's for dinner?" question. Having a meal plan is one of the ways to make sure I stay on track and plan balanced meals for the week. I'd be lying if I said I always stick to the plan (because what would the fun in that be?) but it does help to have a list and an idea of how to make the week efficient. Sometimes, the unplanned gets in the way (a sudden desire for a night-out or a last minute work event) but having an overarching plan does help. Halloumi cheese is my current mid-week saviour. If you haven't tried the king of squeaky cheeses yet, I urge you to get some next time you're grocery shopping! It's pleasantly salty, holds its shape when cooked and, with ease, transforms everyday side salads into hearty mains. 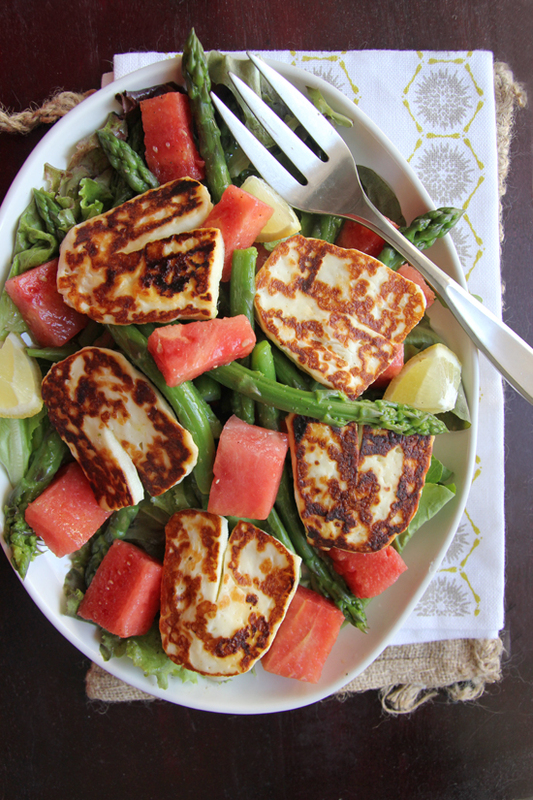 I love combining the cheese with chunks of watermelon and seasonal asparagus at this time of year -- it takes minutes to put together and helps welcome summer with open arms. My second CSA box arrived last week and, with it, came a bounty of rhubarb. Well, actually maybe not a bounty, but 5 healthy pink stalks. There's this weird phenomenon with CSA produce where you both get a lot and not very much of one type of vegetable or fruit. Can you CSA endorsers relate? But that is the challenge, and the fun of taking part in a CSA -- or Community Supported Agriculture -- program. 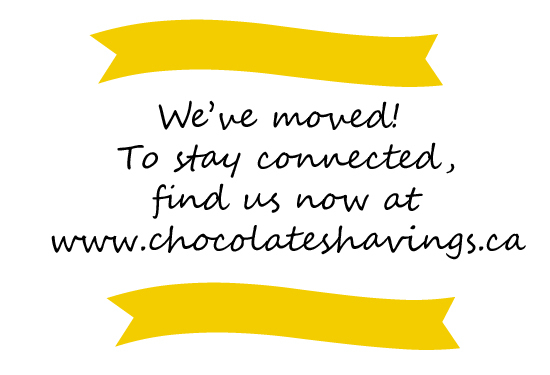 It's a fantastically delicious way to take part in your community and to eat seasonally and locally. It's essentially like buying stocks in a farm, and getting a portion of whatever the farm produces that year as payment. I pick up a box or produce every week from now until the end of the summer, a couple blocks from my apartment. It means there is a lot of fresh cooking going on in my kitchen, but also a bit of a constant "what's for dinner" challenge because you can't fully plan your meals ahead of time! The rhubarb we received didn't come in sufficient numbers to make a pie or tart as I would have hoped, but I turned into the next best thing I could think of: rhubarb simple syrup! 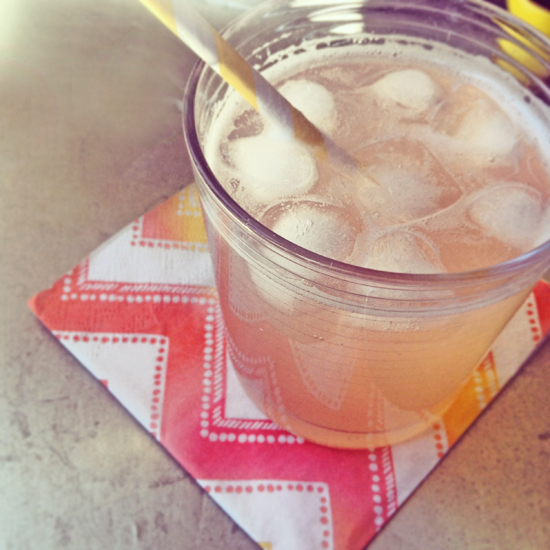 If you haven't made flavoured simple syrup before, this recipe is a great one to start with. Simple syrup -- a, yes simple! -- mixture of sugar and water is great to use in drinks and summer treats, like popsicles. Once the sugar has dissolved in water, it stays at an eternal syrupy stage making it perfect to add to lemonades, ice tea or cocktails of any kind. This version is simply topped off with carbonated water, but would be delicious as an evening cocktail with a little vodka or other strong liqueur. Even if your rhubarb doesn't seem that pink when you cook it down, rest assured, the end result will take on a lovely pink hue once strained. Ask me any day of the week what I'd like to have for dinner and I'll probably ask for seafood. Whether it's steamed lobster drizzled with olive oil, lemon and salt, seared scallops on top of a velvety potato puree or clams tossed with al dente spaghetti and white wine, properly cooked seafood always makes the top of my list. 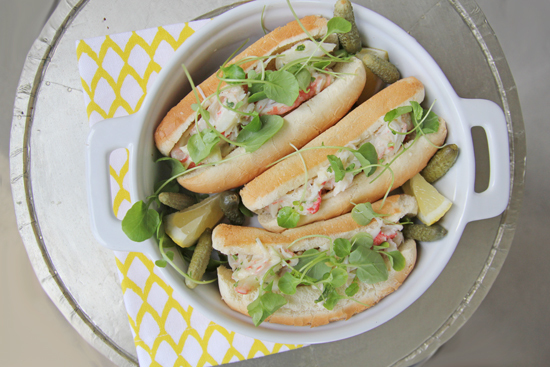 This week's recipe features sweet and meaty snow crab - a great alternative to lobster when cut into chunks and tossed with homemade mayo. It happened to be on sale at Whole Foods this weekend and I just couldn't resist coming home with a bagful. If this isn't an invitation to summer, I don't know what is!